Expository Writing: Annotation2:Delete his (D:) or not? After finished our presentation last week, I tried to find more sources to prove my suggestion. This time is not only the source which on academic research, but about public's opinion. So I found something interesting information on the Internet. I found a news which said there is a group called Taipei Women's Rescue Foundation was going to have a survey. This organization wanted to know the mind of people who watched adult videos, so they asked for "adult-video volunteer" first, of course the volunteers were anonymous, and their job was watching adult video together, and then filled out the questionnaire. After their coordination, they convened a press conference, and showed the results about "The Situation of People Who Watched Adult Videos in Taiwan" and "Transnational Report about Watching Adult Videos". 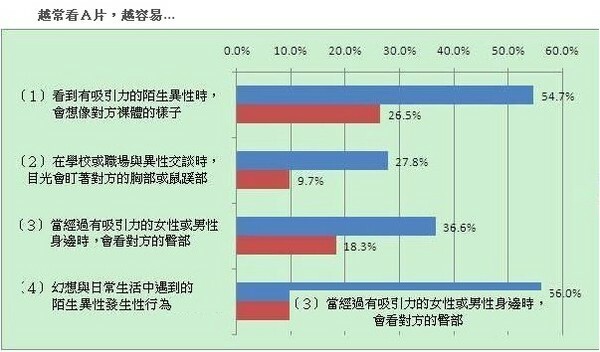 According to the data, the rate of the minority in Taiwan who watched adult videos was up to 90%, the frequency of watching adult videos was also the top among many countries. The research also indicated that the frequency of watching adult videos was higher, or the more exaggerative plots people who likes, it might influence the intimate relationship between couples more, too. Even caused their sexual life. 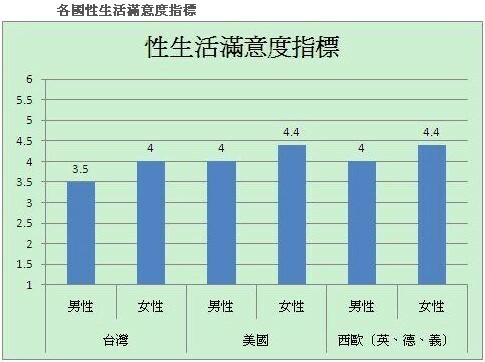 ↑Source2: Taiwanese like to watch adult videos more than other countries, but have worse satisfaction of sexual life. ↑Source1:Adult videos' influence in our life. So I think every couples should really take watching adult videos serious because it might become your big problem one day.